Horticulturists understand azaleas as a number of species of the genus Rhododendron that shows special characters: five or six stamens comparative to most species that have 10 stamens, leaves with softer underside and microscopic scales presenting spherical shape. 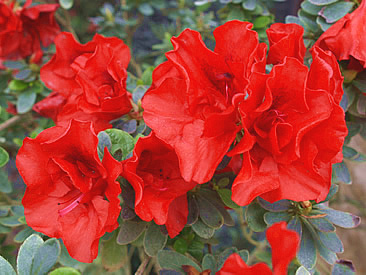 In the greenhouses of the Botanic Garden "Anastasie Fatu" from Iasi 35 varieties of Rhododendron simsii are grown. The diversity of colors of these flowers varies from the pure white of the 'Petrick Alba' and 'Pax' varieties to the cheerful pink of the 'Vervaeneana' variety, to the well-known purple of the 'Concinnum' variety or the intense red of the 'Superba', 'Europe' and ‘Rolco' varieties. Camellias are plants native to tropical and subtropical regions of Southeast Asia, China and Japan and the number of species in this genus is estimated at about 120. They are shrubs or small trees that generally prefer areas with high altitude. 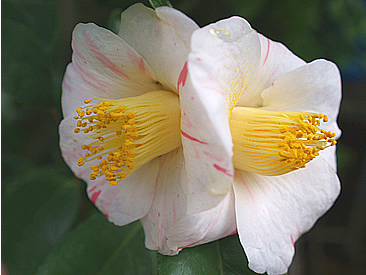 Collections of the Botanic Garden from Iasi include 12 varieties belonging to the Camellia japonica L. species. Among them, there are some very old varieties as 'Alba Simplex' ('Snow Goose') dating from 1819 and 'Alexander Hunter' obtained around 1884. The flower’s color ranges from pure white ('Alba Simplex') to pale pink ('Elegans') or deep red ('Chandleri Elegans'). 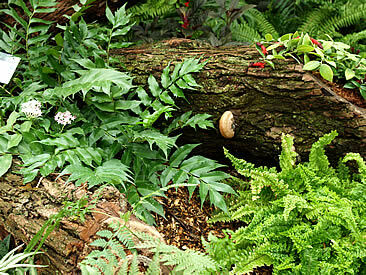 Tropical areas are known as the richest in species and zone from where come many ornamental plants loved by amateurs. Here originated the majority of the over 850 species of the genus Ficus (F. benghalensis, F. benjamina, F. elastica, F. lyrata, F. platypoda, F. rubiginosa, F. sagittata) known for their content in latex and the adventitious aerial roots. 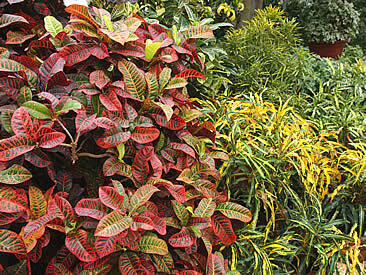 A very popular group of plants is represented by crotons (originating from Malaysia). Under this name are known varieties with colorful leaves of Codiaeum variegatum var. pictum (Loddiges) Müller Argoviensis, Botanical Garden's collection including 25 varieties such as ’Goldfinger’, 'Goldstar', 'Norma', 'Petra', 'Pictum'. Part of the same Euphorbiaceae family is Acalypha godseffiana and A. hispida, originating from the Papua and New Guinea islands. Dracaena genus, with spreading from Africa to Asia and even Central America, is represented by some varieties with variegated leaves of D. deremensis and D. marginata species. Collection of botanical garden ferns grouped large specimens of Asplenium nidus or that very small from the Selaginella genus. Specimens of Nephrolepis exaltata ‘Hillii’ are attractive by the shape of leaves, those of Pteris cretica ‘Albolineata‘ by variegated leaves and Adiantum by the very fragile appearance. Perhaps the best-known interior fern is Platycerium bifurcatum, whose divided leaves remember the look of elk horns. 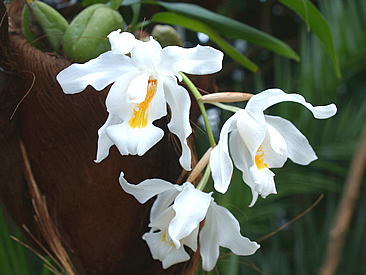 In the collection of the Botanic Garden of Iasi there are over 60 species and hybrids, many epiphytic (Cattleya labiata, Lycaste aromatica, L. deppei, Stanhopea insignis, S. hernandezii) and specimens that grow well in soil (Paphiopedilum, Cymbidium, Phalaenopsis). Cactus collection of the Botanical Garden brings together species ranging from very large to very small, as are those of the genera Chamaecereus, Dolichotele, or with suggestive shapes (Astrophytum), "fluffy" aspect (Espostoa, Pseudoespostoa), colorful flowers (Aporocactus), "monster" aspect or obtained by cutting. Also from arid areas of Central and South America are large specimens as Nolina recurvata, Pedilanthus tithymaloides ‘Variegata’ and varieties of agave. 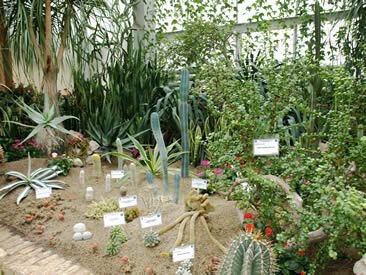 African Flora is represented by very different species as Euphorbia canariensis, E. leuconeura, E. milii, E. tirucalli, E. trigona, E. caput-medusae, Portulacaria afra, Aeonium arboreum, and A. domesticum ‘Variegata’. 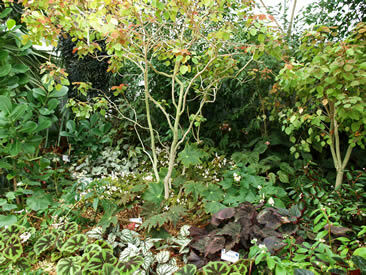 The Begonia genus, with approximately 1500 species, is one of the largest in the world. The most known begonias are herbaceous plants but there are also taxa presenting a sub-arbutus appearance. Although begonias are naturally widespread in the tropical and subtropical areas of Africa, Asia and America, still the highest number of species occupies the wet mountain forests from South America and Asia. Botanical Garden collection present annual species (B. hirtella), at which the multiplication is made just by seeds, and also B. tuberhybrida, known for their beautiful flowers. 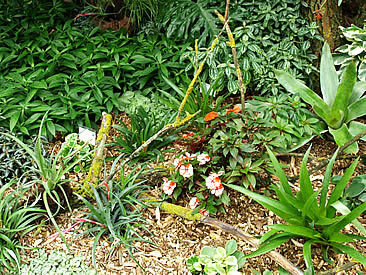 Most taxa in the collection show a variety of leaf size (15-20 cm - Begonia ricinifolia or B. digitata or 2-3 cm - B. foliosa). Leaves chromatics combine in very attractive ways different shades of green - from very intense tones (B. listada) to spring colors (B. ulmifolia) and even glaucescent (B. rex 'Escargot') - to warm tones of ocher, brown or garnet (B. rex varieties). The corrugated appearance of the leaves of B. masoniana surprise by rigidity and roughness. Bromelias is a family of plants with over 3000 species, widespread in South America, Chile and Argentina to Central America and the Caribbean. The greatest number of species is found in Brazil, while in West Africa there is only one species (Pitcairnia feliciana). These plants can be found from sea level to 4300 m, in extreme habitats ranging from dry and cold deserts to rain forests and even cold mountainous regions. The best known species is pineapple, whose varieties with variegated leaves have a decorative value. Botanical Garden's collection includes other decorative bromeliacee both by the leaves and the flowers: Aechmea, Billbergia, Guzmania, Nidularium, Vriesea. Peperomia Genus (akin to pepper) has over 1000 species, most concentrated in Central America and northern South America, and only 17 species from Africa. Botanical Garden Collection brings together a large number of species and varieties of this kind: Peperomia argyreia, P. caperata, P. c. ‘Red Riple’, P. clusiifolia ‘Variegata’, P. griseo-argentea, P. obtusifolia, characterized by a spiciform inflorescence. The decorative role of leaves is show in the vegetable arrangement covering the center of exhibiting greenhouse. Copyright ©2019 Botanic Garden of Iasi. All rights reserved.